Sg Truth: One MRT death every fortnightly? TRAIN services on the North-South Line were disrupted on Vesak Day 28 May 2010 by a man who died on the tracks at Sembawang MRT station.According to a Stomp report, the disruption took place at around 11.40am. A Singapore Civil Defence Force (SCDF) spokesperson confirmed that a man had died on the MRT tracks. According to some readers who were present, train services were delayed for up to an hour at the Sembawang station. The area was cordoned off by the police as well, the readers told Stomp. The initial confusion resulted in some readers thinking that a train had broke down. Reports have yet to established whether the death was an accident or a suicide. SINGAPORE : An SMRT spokesman has said that some 5,000 passengers were affected when an eastbound train service was disrupted on Saturday afternoon. A passenger had jumped onto the track at Tanah Merah MRT Station and was hit by a train heading towards Pasir Ris. SMRT said that to maintain services on the East-West line, eastbound trains were turned around at Eunos and Tanah Merah MRT stations, while the middle platform at Tanah Merah MRT Station was used for eastbound train services. Announcements were made in all stations and on affected trains to inform passengers of the delay and to advise them that the trains may be more crowded. Normal service resumed at around 3.40pm. Passengers who were unable to complete their journeys due to the disruption can claim a full fare refund from the Passenger Service Centre in any of the 58 SMRT stations, within the next three working days. 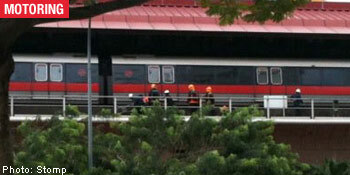 SMRT is assisting the police in its investigation. Half-height platform screen doors have not been installed at Tanah Merah Station. So far, they have been installed at Pasir Ris MRT station, as well as Jurong East and Yishun stations. Why is there such a large discrepancy between the value of contracts awarded to Singapore Technologies Electronics for installation of platform screen doors at SMRT train stations and at Taiwan’s Neihu Line? 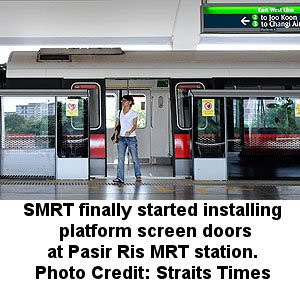 It was reported in the Straits Times on 13 Aug that the first sets of platform screen doors had been erected at Pasir Ris MRT station. Despite repeated calls for platform screen doors to be installed at all above-ground MRT stations to prevent the obvious tragedies, the Government chose to place the lives of commutes second to cost considerations, and agreed to this suggestion only when costs had come down due to the global downturn. This pussyfooting by the Government resulted in 31 unnecessary deaths in 2007, or around one death every 12 days, as a result of accident or suicide on the MRT tracks. The Land Transport Authority (LTA) has awarded a S$126 million contract to Singapore Technologies Electronics to install platform screen doors on all above-ground MRT stations by 2012. Let us hope accidents and suicides at MRT stations in the meantime can be kept to a minimum through vigilance by SMRT personnel. Meanwhile however, netizens have discovered that Singapore Technologies Electronics had been awarded a contract of far lesser value to install platform screen doors for Taipei’s Mucha Extension (Neihu) Line in Taiwan. The information concerning this can be found at ST Electronics website, and was also posted at popular forums like Sammyboy.com. In 2005, ST Electronics was awarded a S$10.5 million contract to design, supply and install platform screen doors for the 12-station Neihu Line, due to be completed by the 3rd quarter of 2009. This works out to be slightly under S$1 million per station. Compare this cost to what LTA is paying ST Electronics to build platform screen doors at SMRT train stations — S$126 million for 36 stations, which come up to S$3.5 million per station. Why is there such large discrepancy in the value of the contracts awarded to ST Electronics for installation of platform screen doors for train stations at two different countries? Is LTA grossly overpaying ST Electronics? Surely costs cannot have gone up over 250% over a period of only a few years! ST Electronics is the electronics arm of ST Engineering Ltd, whose Board of Directors comprise of many establishment-related personalities like Lieutenant-General Desmond Kuek Bak Chye (Chief of Defence Force), Dr TAN Kim Siew (Permanent Secretary for Defence Development), and Mr Davinder Singh (former MP for Bishan-Toa Payoh GRC). ST Engineering Ltd is a Government-linked Corporation that is 50.63% owned by Temasek Holdings as of 16 Feb 2009. Collectively, GLCs account for more than 60% of Singapore’s GDP. There is a need for LTA to justify why it is paying so much to install platform screen doors and awarding such a large contract to a GLC, when a much smaller contract had been awarded to build screen doors in Taiwan. There is a need for greater transparency and accountability in this matter. every one platform screen doors is pay by singaporeans tax,gst and bills to used it for platform screen doors. singaporeans will used other ways to die if platform screen doors i think is waste of money man.